Abdul Rahim Rahman expects Budget 2012 to boost the property and construction sectors. The RM232.8bil budget tabled by Prime Minister Datuk Seri Najib Tun Razak on Oct 7 was formulated with the theme National Transformation Policy: Welfare for the rakyat; well-being of the nation”. It aims to implement development plans such as projects and programmes under the Second Rolling Plan (RP2), National Key Economic Areas (NKEA), National Key Result Areas (NKRA) and Strategic Reform Initiatives (SRIs) focusing on the well-being of the general population and aiming at stimulating the domestic economy. The Government is targeting GDP growth of between 5.5% and 6.0% for 2012. However, our external environment has become increasingly challenging with the economic slowdown in the United States, Europe and Japan, inflationary pressures due to rising commodity prices, and the European debt crisis. The International Monetary Fund revised its projected world economic growth to 4% and world trade to 5.8%. The Malaysian Institute of Economic Research (Mier) has revised the country's gross domestic product (GDP) growth to 4.6% this year compared with an earlier forecast of 5.2% due to slowing exports and weaker domestic demand stemming from a volatile global outlook. Next year's GDP has also been revised to 5% from 5.5%. In view of these challenges, it is critical that the Government implement measures to stimulate the domestic economy, both public and private investments. The momentum for the construction industry is expected to accelerate with various projects to be implemented under Budget 2012. While contribution of the construction industry to GDP has always been small, it is projected to grow by 7% in 2012, the highest growth compared with all other sectors. Its multiplier effect has always been large, involving 146 sub-sectors. Therefore, we expect the special stimulus package worth RM6bil for the construction industry to have positive effects on the economy. The construction projects announced by the Government will benefit not only big players but also the entire value chain including small players. The RM40bil MRT project is expected to stimulate property development along the MRT line with some developers trying to take this advantage by building affordable homes in the suburbs near the MRT line. It was announced recently that Mah Sing has entered into a share sale agreement to acquire the entire stake in Semai Meranti Sdn Bhd, which is the beneficial owner of a piece of freehold development land (with development order) in Rawang, measuring 225.7 acres, at a total purchase consideration of RM92mil. The land will be developed into a self-contained township named M Residence@Rawang, offering entry level homes priced from RM390,000. SP Setia has also recently announced its second land deal in the Semenyih-Kajang corridor buyinga 269.3ha site for RM381.26mil in Ulu Langat to be developed into a township with an estimated gross development value (GDV) of RM4bil. The land is adjacent to its current development, the Beranang Land with an estimated RM3.5bil GDV. The site is about 13km south of Kajang town and homebuyers are expected to benefit from the proposed MRT station in Kajang. SP Setia plans to build affordable homes to cater to first time home buyers. The Federal Government's proposal to liberalise 17 services sub-sectors in phases next year has also received positive reactions from investors. This liberalisation will benefit private hospital services, medical and dental specialist services, engineering, accounting and taxation, and legal services. Looking at the real estate side, we expect more new township developers will include private hospitals and other medical services as part of their development components in their effort to create self-contained townships. The implementation of main projects under RP2 such as Gemas-Johor Bahru double track rail project, Lebuhraya Pantai Timur Jabor-Kuala Terengganu, Lebuhraya Pantai Barat Banting-Taiping, Lebuhraya Segamat-Tangkak and Lebuhraya Central Spine as well as the construction of Kota Marudu-Ranau road will create greater accessibility to less developed areas in Malaysia, which will then spur development in these areas. The RM978mil allocated to implement projects such as Johor Bahru-Nusa Jaya coastal highway in Iskandar, Johor, heritage tourism development in Taiping in the Northern Corridor, agropolitan scheme in Besut in the East Coast Economic Region, palm oil industrial cluster project in Lahad Datu in Sabah Development Corridor and Samalaju water supply in the Sarawak Corridor of Renewable Energy is expected to accelerate development in the five regional corridors and this will help the Government to achieve its development objective of creating more balanced regional development in the country. Incentives offered to KLIFD-status companies not only emphasise the Government's effort to turn Kuala Lumpur into a global financial centre but also attract more investors to participate in the development of the project. The project is aimed at enabling Malaysia to capitalise on its international Islamic financial products and and this is further strengthened with measures proposed in the budget to stimulate the sukuk market and provide the seed money for shariah-compliant exchange traded funds (ETFs). The incentives are a 100% income tax exemption for a period of 10 years and stamp duty exemption on loan and service agreements for KLIFD-status companies, an industrial building allowance and accelerated capital allowance for KLIFD Marquee Status Companies; and income tax exemption of 70% for a period of five years for property developers in KLIFD. It is hoped that with these incentives, KLIFD will be able to compete with other financial centres in Asia. The real property gains tax (RPGT) is also proposed to be revised as one of the measures to cool the property market. In Budget 2012, it was proposed that the RPGT on properties held and disposed of within two years be raised from 5% to 10%, 5% tax to be maintained for properties disposed after three to five years and no tax for properties disposed after the fifth year. From a macro-economy perspective, a higher RPGT will reduce speculative buying, which will then stabilise property prices and this will avoid “property bubbles” from bursting. This step is necessary as property prices, especially in prime areas such as in Klang Valley, Penang and Johor have increased over the last two years between 30% and 50%, depending on location and type of property. This measure is considered “mild” compared with more stringent measures imposed by other countries such as Singapore, which imposes a lower loan-to-value ratio (60%) for borrowers with more than one outstanding loan and higher seller's stamp duty. As one of the NKEAs, the tourism industry will also receive a shot in the arm. For example, RM420mil will be allocated to launch the Langkawi Five Year Tourism Development Master Plan. Among the initiatives to be undertaken are the restructuring of the Langkawi Development Authority, setting up a park rangers unit, upgrading museums, beaches and small businesses as well as providing a more efficient transportation system. In my view, to create a more supportive environment for the tourism industry, it is of high importance for the Government to also re-look at current restrictions on buying and investing in properties in Langkawi. The island has great potential; however, more needs to be done to attract hotel operators as well as investment in tourist-related activities as the current regulations are considered as “unfriendly” to foreign buyers or investors. In an effort to attract high-spending tourists and to encourage investment in hotels at par with international standard, the Government also proposed that 4- star and 5-star hotel operators in Peninsular Malaysia be given pioneer status with income tax exemption of 70% or investment tax allowance of 60% for 5 years. This incentive is expected to encourage more hotel development, which many hesitate to venture into because the payback period is normally as long as 10 to 15 years. Overall, I would conclude that Budget 2012 is very comprehensive and the Government has focused on every aspect that will stimulate the country's economy considering the many external challenges that we are facing now. It is undeniable that Klang Valley's built environment is on the threshold of some major changes with ongoing plans to improve the infrastructure network, such as the My Rapid Transit (MRT) project and the planned redevelopment of some of the Government's land. The days of the present property landscape may be numbered as old and dilapidated buildings may be demolished to make way for other new projects and buildings. In this regard, it is imperative to ensure that historical buildings should be spared and property owners of buildings that need to make way for this development process, will be duly consulted and compensated. While the pursuit of new development projects is well and good in the name of growth and development, we must ensure that at the end of the day the projects will offer more greater good to the larger populace. The gauge on how successful the project will turn out should not be just based on its quantum of material or monetary benefit, but what is equally important is that it must offer a greater net benefit after weighing both the economic and monetary, as well as non-monetary components. Ultimately the success of a development project should be measured by the accrued benefits to the people and how it will help towards adding value to their overall well-being. As such, when assessing the viability of projects, instead of just considering the monetary costs and benefits, it is equally important to give due consideration to the non-monetary and social benefits and costs. Project planners should ensure that the total accrued benefits will at least equal or outweigh the total cost. In this regard, it is important to bring to bear all the components of the costs and benefits in their assessment. One good example is the need for a workable national public housing programme. If the project's viability is just measured based on the total monetary benefits against the costs, it won't be surprising to see that the cost-to-benefit study will turn up negative to show that the cost outweighs the benefit. Given that these housing units have to be priced affordably at a certain price threshold, it may fail on the benefits side of the equation if it is just based on the monetary benefits. But adding up all the social benefits of a well run public housing programme will show that it is a highly desirable and beneficial project to the public. This is because as far as the benefits are concerned, it is not just about the total income or profit to the developer, but it is also about how a wholesome, safe and well built environment will benefit and help the average Malaysians and their families to thrive and make good in life. If these public housing projects are well designed with reasonably sized built-up to fit at least three rooms, have space for community and sports activities, and are safe and well managed, the benefits will come in manifold. These include thriving, happy and closer knit families; more responsible adults and parents; less divorce cases; better behaved and high performing children; and less cases of truancy, dropouts and other social menaces. I always believe that the foundation for a thriving and healthy society starts with the family unit. As long as we continue to keep our family unit functional and thriving, many of the ills facing our society today will be nipped in the bud. Given the wide ranging benefits of having a well planned social housing programme, it should be accorded top priority and more resources should be allocated to ensure its success. Likewise, there are also many non-monetary benefits from a well integrated and efficient public transport system that warrant it being placed on the priority list as well. These include less hassle and stressful city living; higher productivity if the people can move around with ease which means spending less time on the road; and hopefully they can also save up money for rainy days (by not having to own and maintain a car). To ensure its success, the whole array of public transport network should be integrated and be complementary to each other, instead of competing with each other for business. It can be likened to the chicken or egg situation. Once the infrastructure is in place and running efficiently, I believe many Klang Valley folks will voluntarily resort to using public transport. Come to think of it, the construction of the new MRT stations and tunnelling works will no doubt cause massive traffic jams and congestion when the time comes. This is not something Klang Valley folks are looking forward to, and it is imperative that advance arrangements are made to redirect traffic flow and ensure the construction work will not be disruptive to road users. As it is, many roads in the capital city are already heavily choked by the heavy vehicle traffic especially during rush hours. The current wet spell only serves to worsen the situation. Deputy news editor Angie Ng looks forward to a holistic, wholesome and sustainable living environment that will be functional and relevant for many years to come. 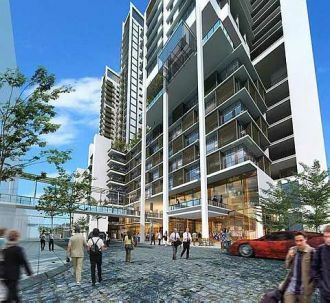 An artist’s impression of the new phase of Jaya One in Section 13, PJ. JAYA One, one of several developments in Petaling Jaya's Section 13, will be increasing its footprint with a new phase of commercial development to complement the current five commercial office buildings located at the junction of Jalan 13/6 and Jalan Universiti. Construction of the new phase has already started and will comprise 400 retail, residential and office units on an additional four acres of land, says Tetap Tiara Sdn Bhd executive director (Jaya One) Charles Wong. “When we launched the first phase of Jaya One in 2004, it took a bit of convincing the market that office properties would sell. We did not do residential because we knew that it would not work. Now that we have completed the first phase, we are ready to launch residential units in the form of serviced apartments,” he says. The new phase will comprise 30 units of retail and 130 office units. There will also be 240 units of serviced apartments spread over two blocks. The new phase will consist of a gross built-up area of about 993,000 sq ft, bringing the gross area up to about 1.7 million sq ft. Prior to the development of Jaya One, the 11-acre site was occupied by a factory. The retail portion is priced between RM850 and RM1,300 per sq ft. Sizes range from 1,200 to 3,500sq ft. The office portion is priced at RM580 per sq ft. The first residential tower of 13 storeys is priced at RM600 to RM650 per sq ft while the four-storey, second residential block is priced at RM600 per sq ft.
“Section 13 will be a dynamic market as the local authorities have put many new requirements in place. There are several serviced apartment projects coming up. Among the new requirements is the need for developments to be inter-connected with one another. The most practical way will be the provision of bridges to link the projects together. We will be building connecting bridges to neighbouring developments to allow easy access and movement among the buildings within Section 13,” says Wong. He says there will be greater setbacks between neighbouring lots and internal roads are being planned to avoid adding pressure to the current three roads that service the area. Currently, the three roads are Jalan Universiti, Jalan Kemajuan and Jalan Semangat. Internally, Section 13 is served by Jalan 13/6. Wong says the authorities are trying to get land owners to amalgamate pieces of land to avoid ad hoc development. The gross development value for the new phase is RM360mil for the portion of the development the company is selling. The company will retain a certain portion for recurring income as it did with Palm Square, which comprises mainly food and beverage outlets in the first phase of the project. Wong says thus far, most of the buyers are investors with about 20% buying for their own use. The first phase is currently fully occupied with offices being rented out between RM2.50 and RM2.80 per sq ft, retail outlets at RM6.50 and RM7 per sq ft and Palm Square RM8.50 and RM10 per sq ft.
Wong says a large number of those who bought into the new phase had previously bought into the first phase. Besides Tetap Tiara's serviced apartment blocks, there are currently two other serviced apartment projects being planned for Section 13. KUALA LUMPUR: Smart City-Smart Village, the second high-impact project to be implemented through Global Science and Innovation Academy Council (GSIAC), is expected to contribute RM95bil to the national economy by 2020. It was also expected to increase opportunities in the service industry and create employment across the value chain for 420,000 people, GSIAC said in a statement. “The Smart City-Smart Village project aims at balancing development in the urban and rural areas, focusing on the use of green technology and information and communications technology (ICT). “The goal of the initiative is to improve everything from energy use to healthcare, education, traffic and shopping by doing it ‘smart’ with the help of ICT and green technology,” it added. GSIAC yesterday hosted a Smart Communities Workshop together with the Malaysia Industry-Government Group for High Technology (MIGHT) and New York Academy Of Sciences to gather inputs for the implementation of the Smart City-Smart Village projects in Malaysia with other key stakeholders. MIGHT president and chief executive officer Mohd Yusoff Sulaiman said “green field” and “brown field” projects had been identified for the Smart City programme. “In a green field project we find there’ll be a very good opportunity to develop new cities like the Iskandar region and cities near the Greater Kuala Lumpur area. “In a brown field project such as the present city of Kuala Lumpur, we see a need to also see beyond the elements of infrastructure such as social development, culture and the value we can add to the existing city development to raise the quality of life,” he added. The Selangor state government has no power to fix a flat rate or offer discounts for residents of the Sri Aman low-cost flats in Section 22, Petaling Jaya, who are having difficulty paying for their transfer of land status to strata title. Kampung Tunku assemblyman Lau Weng San, in rebuking a statement made by Selangor MCA Public Services and Complaints Department deputy chairman Kelvin Chong Seng Foo, said the state government was not involved in matters pertaining to payments to obtain the strata titles by the residents. Two weeks ago, Chong, who is Kampung Tunku co-ordinator, urged the state government to fix a flat rate and “to be fair to all low-cost unit owners” as they all have different rates to pay for the transfer of strata title. Lau rebutted by saying that this was an issue between the residents, the Sri Aman low-cost flat developer and their respective lawyers who are handling the transfer of land status. “It is incorrect for Chong to say that the state government is charging a high fee for the residents for the transfer of land status to strata titles. “However, I have made a request to the state government to extend the Oct 15, 2011 deadline for the residents to settle the fees for the strata title allocation. “In this matter, we do have the power to make the time extension under Section 40A (2) of the Strata Titles Act 1985,” explained Lau after meeting with the residents of Sri Aman low-cost flats. He also urged the residents to settle their outstanding debts to the Sri Aman Joint Management Body (JMB) to expedite the process of obtaining their respective strata titles. “Some of them have yet to pay up their maintenance fees which includes the sinking fund and water bill. “This will only slow down the process of getting the strata titles. It is not possible for the state government to help the residents pay for their outstanding arrears because it will be unfair to other low cost unit owners who have settled their debts,” added Lau. In October last year, all 342 households of Sri Aman flats received notices from the developer requesting them to pay the processing fees to exercise the transfer of land status to strata titles. The residents were given a year to settle the processing fees which range from RM500 to RM2,000. 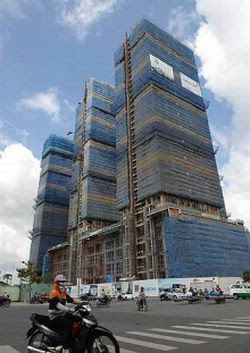 FOREIGN property developers should take a serious look at Vietnam despite the country's macro-economic challenges amid a struggle to subdue double-digit inflation without dampening growth, according to commercial real estate firm Colliers International research director Naim Khan-Turk. While noting that the property market in Vietnam is currently in a downturn, Naim is expecting the situation to improve in two years. Naim's expectations are not without foundation as a few years ago, Vietnam was seen as a fast-growing “Asian tiger” with an emerging market of about 86 million people and a low-cost labour force. Today, Vietnam is grappling with rising consumer prices, a weakening currency and a tight credit policy while trying to revive optimism concerning its economic growth. Naim, who has been based in Ho Chi Minh City for more than seven years, recalls that from 2005 to 2009, it was a boom time for the development and growth of the real estate market in Vietnam. “A few years ago, at the peak of the cycle in the real estate market, there was plenty of money swimming around for developers to use. At that time, we had every fund in the world coming into Vietnam wanting to do this and that. Now, the situation has gone the other way, and developers cannot get their hands on money to finance their projects,” says Naim, who spoke to StarBizWeek on the sidelines of the two-day Mixed-Use Development 2011 conference, organised by Trueventus Sdn Bhd in Kuala Lumpur, which gathered experts in property development in the Asia-Pacific region. In October, inflation in Vietnam accelerated to 21.59% from a year earlier. The high consumer price index (CPI) for October meant that inflation had slowed for a second month, after climbing to a high of 23% in August. This month, in order to subdue Asia's highest rate of inflation, Vietnam's central bank also raised its refinancing rate to 15% from 14% previously, while maintaining its base interest rate at 9%. “What this means is that the credit crunch in Vietnam has resulted in the real estate market becoming very compressed, and a lot of property developments are slowing down or not starting. Certain projects are still moving along but things have been put on hold to a certain degree,” says Naim. Naim also reiterates that property development in Vietnam is a long-term process for investors. Naim says foreign property developers in Vietnam need to allocate time to build their networks, establish contacts and secure land. According to Naim, the process of obtaining an investment license in Vietnam has been made easier nowadays. He points out that Vietnam is an emerging market offering many opportunities. Naim says foreign companies that have been successful in Vietnam are the ones that took the long-term view, and cites Malaysian examples such as SP Setia Bhd, Berjaya Corp Bhd, Gamuda Bhd, WCT Bhd and Ireka Corp Bhd. According to Naim, margins can be 23% to 25% for a typical property development in Vietnam. He recalls that office rentals in Ho Chi Minh City peaked at US$70 (RM218.80) per sq metre before the global financial crisis in 2008. Naim notes that new commercial buildings are steadily growing taller and with more modern designs.